Mike Martin shoots for one last shot at the national title in 2019. The one overriding factor to this year’s coaching carousel is the fact that a lot of traditional powers have been scuffling and in need of a major injection of adrenaline in the program. The coaching storylines may be the most dynamic in our sport for a number of years. The kickoff point would be the impending final season for the legendary Mike Martin, who is the winningest coach in our sport. Beyond that, some intriguing new hires will be under the spotlight this year, along with a few that might be considered on the proverbial hot seat. Here are the most interesting coaches to watch in 2019. Of Note: Announced that he will retire at the end of this season. One of the greatest individuals I have ever interviewed in my years of being a college baseball writer. With his good ole boy feel to him, “11” is 100 percent genuine. Every coach or administrative assistant I’ve talked to said that there is not an insincere bone in his body. But the poor dude has also been the Susan Lucci of our sport, being the consummate runner up and never bringing home the Emmy, despite 16 trips to the College World Series. Unfortunately he won’t have his best team this year, but remember that he has never had a team in his 39 years that won less than 40 games. Unbelievable. Arizona State’s Tracy Smith needs a big season. Of Note: Two straight seasons at 23-32. 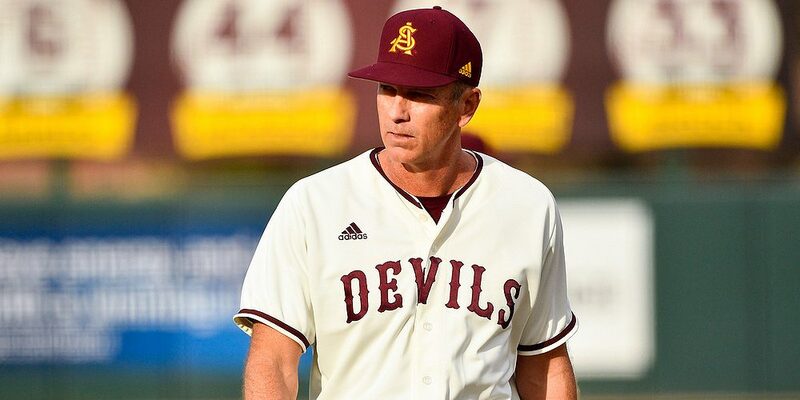 At the end of last season Arizona State athletic director Ray Anderson said in a press conference that he expected “significant improvement” in the program in 2019, hinting that this is a win-or-else proposition for the Devils maestro. Smith went 287-237 in his nine years at Indiana, taking the Hoosiers to the College World Series in 2013, which he parlayed into the gig in the desert. It’s been a rough ride the last two seasons, but to his credit he should have his best team in Tempe this year and one of the best middle-orders in the country with Spencer Torkleson and OF Hunter Bishop back in the lineup. Of Note: Went 141-91-2 in four years at Indiana. Talk about being given the keys to the kingdom. The hiring of the very-likable Lemonis was one of the more interesting hires in the offseason, being that he has no ties to the Starkville campus. Despite this “carpetbagger” having a good string of success in Bloomington, Lemonis is also a crack recruiter and should thrive in this utopia of college baseball, given the facilities and the resources MSU has. But there will certainly be pressure on him and his staff to win, and win right away. Anything less than the NCAA Tournament will bring instant “hot seat” status. Remember, this is a place that gave the boot to a man who led the Bulldogs to the College World Series last season. Pat Bailey (in orange) takes the reigns of the Oregon State program for 2019. Of Note: Was elevated to “Interim” head coach after Pat Casey retired in September. Bailey was elevated to head honcho status after eleven years as the top assistant to Casey, who made a surprise retirement announcement this past offseason. But this won’t be a completely cold handoff since Bailey has been an integral part in every day-to-day operation from the drills at practice to the schedules to the travel arrangements. He’ll also still have one of the best pitching coaches in the country in Nate Yeskie and one of the best players in the recent history of college baseball in Adley Rutschman to help ease the transition this season. It will be interesting to see if the “interim” title is removed at some point. Of Note: Miami is coming off its second straight non-NCAA Tournament season. Yes you read that correctly, the Hurricanes had a 44-year streak of appearances in the NCAAs come to an end in 2017, and last year was the second straight year to miss the field of 64. That was the final year of the Jim Morris era in Coral Gables, and immediately DiMare was tapped to be his successor. This year could be another struggle as the Canes have three freshmen and five sophomore in their projected starting lineup. But their last two recruiting classes both ranked at No. 8 by D1 Baseball, so the talent is there. After getting Tennessee Tech on a June hot streak and winning 52 games last year, Bragga is now taking over for the legendary Wayne Graham. It won’t be easy, even with the last two years where the Owls lost 31 games each season. The long-time Gopher leader is coming off his best season with 44 wins and a No. 9 final national ranking. His 2019 team will be pitching-heavy but this will be the first season in 33 years where he won’t have his trusty sidekick Rob Fornasiere as his assistant, after his retirement last June. It’s been a lean few years for the head Duck, having finished in 8th place in the Pac 12 each of the last three seasons. The feathers are getting ruffled but this is a team that has the horses to get back to the NCAA Tournament this season. And they will need to. Talk about some lean years, the Shockers haven’t been to the Big Dance since 2009. They did win 35 games a year ago, but a 7th place finish in the AAC won’t quell those rabid fans. Losing heavy hitters like Alec Bohm, Greyson Jenista and Gunnar Troutwine will be tough to overcome too. – The Notable Volunteer Assistants. During my preseason work I’ve noticed a handful of well-known volunteer assistants. • Mitch Gaspard, former Alabama head coach is a volunteer assistant at Georgia (last year, now-Kansas State head coach Phil Hughes was the volunteer assistant). • Greg Goff, who was head coach for Campbell, Louisiana Tech and Alabama, is now the volunteer assistant at Purdue this season. • Greg Maddux, the four-time Cy Young winner, is entering his third season as the volunteer assistant at UNLV. His son Chase is a pitcher for the Rebels.